The plastics industry sees fracking as a huge opportunity for their profit margins. But plastic has already entered our food and water supply and our bodies–one more reason we need to move off fossil fuels before the problem gets even worse. Bottled water samples fared even worse than tap water–unsurprising because it is manufactured with plastic. Another recent study by the same organization found 90 percent of bottled water analyzed from around the world contained plastic microfibers. A single bottle of Nestlé Pure Life had concentrations of microfiber plastics up to 10,000 pieces per liter. The type of plastic used to make bottle caps was the most common type of microplastic fiber found in bottled water. In response to the mounting evidence showing plastic is present in our drinking water, the World Health Organization is now looking into the problem. Plastic has also been found in sea salt, and researchers attribute that to the ubiquitous nature of single-use plastics such as water bottles, which comprise the majority of plastic waste. In 2015 about 70 percent of plastic water bottles went unrecycled, and much of this plastic waste ends up in landfills, incinerators or in–you guessed it–our oceans and seas. Plastic has also been found in seafood, beer, honey and sugar. We need more research on the extent of microplastic pollution and the best ways to treat water to remove it. It’s also clear that we need to upgrade water treatment plant infrastructure so it can handle this new pollutant. But the best way to address this pollution is at the source by reducing plastic waste in the environment. Fracking, which causes many negative public health problems and harms our air, water, and climate, is now powering a dangerous plastics bonanza. It was the rapid expansion of fracking in the United States that led to a gas glut, which drove real natural gas prices to the lowest level in decades. This is where the plastic industry came to the rescue of the oil and gas industry: low-cost ethane, a byproduct of fracking, is used to manufacture plastics. Both plastic and ethane are being exported across the globe. 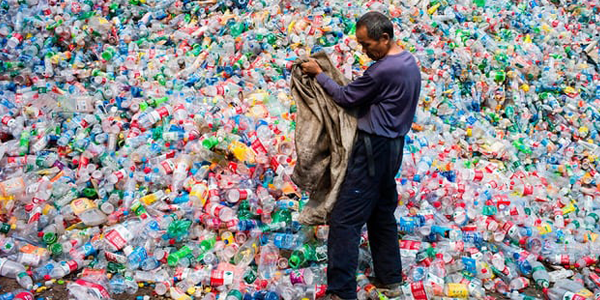 More than half of the raw plastic produced in the U.S. is headed to distant shores. Whereas the chemical giant Ineos, based in the United Kingdom, is receiving ethane to help fuel European plastic factories. The controversial Mariner East pipeline system delivers this gas byproduct to the Marcus Hook export terminal in Pennsylvania–where it is then carried via massive “dragon ships” across the Atlantic to Ineos’ facilities in Grangemouth, Scotland and Rafnes, Norway. What represents an “opportunity” for the plastics, oil, and gas industries means adverse health effects and climate catastrophe for all of us. To learn more about the toxic relationship between the plastics and fracking industry read our fact sheet, and spread the word: we can’t tackle plastic pollution without moving off fossil fuels.